1: Speed: Go fast or go home! 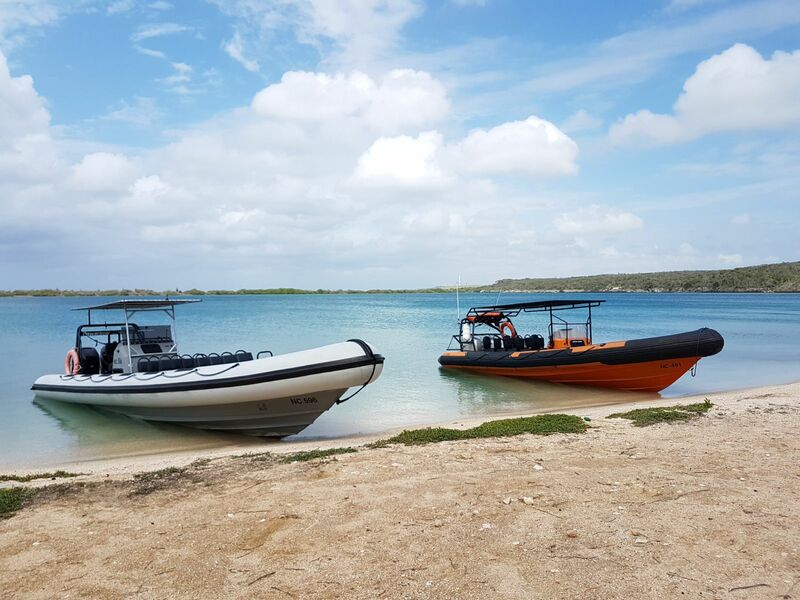 Most boats take approximately 1-1,5 hours (or even longer) to get from Curacao to Klein Curacao. 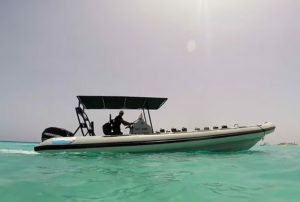 With the Powerboat it takes you less than 1 hour, often only 45 minutes! This is of course depending on the sea conditions like wind, waves and current. Our record is 16 minutes! Of course we will always take the group into account and when the sea is rough we will adjust our speed accordingly. For this reason we ask you to move with the boat and to squat when we jump over waves. 2: With the Powerboat you will not be sea-sick. Do you get seasick quite fast? Is your stomach not quite ocean-proof? 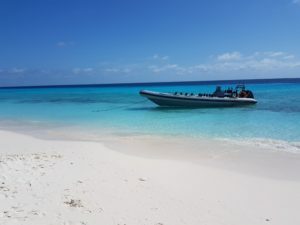 Then the Powerboat is the best boat to take you to bounty island Klein Curacao. 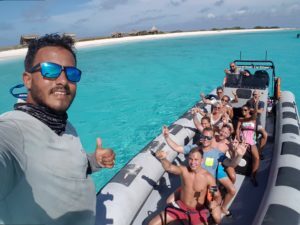 You can read other guests’ experience here, many of them were afraid to get seasick and with the Powerboat they did not! The magic is that we are a fast boat and we are low on the water, as a result of which we do not rock back and forth! 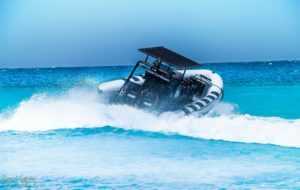 The Powerboat is nicknamed ‘The Beast’ for a reason. With 600 HP behind the boat we reach speeds of up to 100 kilometers. 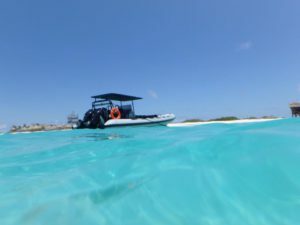 Take a look at our Youtube-video’s here to get an impression of what it is like to be on board of Powerboat Caribbean. The captain is an experienced skipper who is responsible and will always do his utmost to guarantee your safety on board. Waking up at 6 am to catch a boat is not most people’s idea of a vacation. In addition, you might get seasick during the 1,5-2 hour transfer! 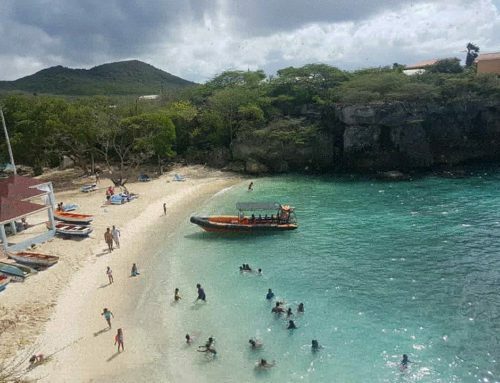 The Powerboat leaves at 10 am from Zanzibar at Jan Thiel Beach so you can party the night before, sleep late, have some morning coffee and get on the boat around 10 am. We get back at the pick-up location around 4 pm so you can enjoy the happy hour on Saturday at 5 pm or relax on the beach. 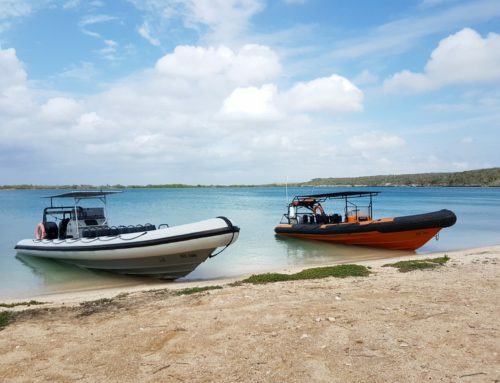 With the Powerboat you do not ‘lose’ a whole day on Klein Curacao but you can combine it with some more activities as you please! The Powerboat has maximum 10 people on the boat for all trips. This small-scale experience is what all of our guests have praised us for. 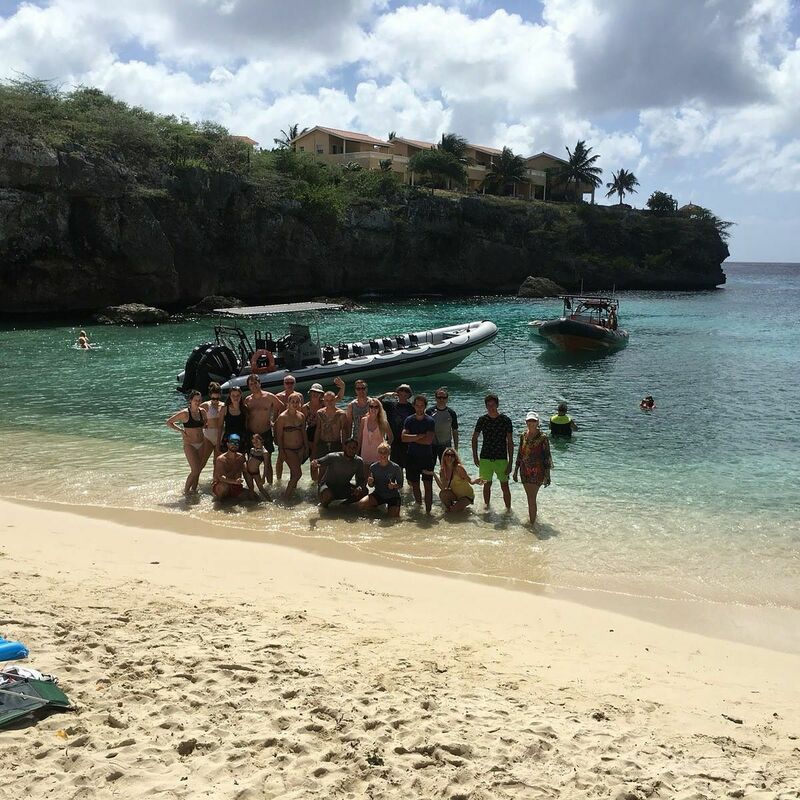 The captain is from the island and can tell you a lot about Curacao and he has some fun facts for you! 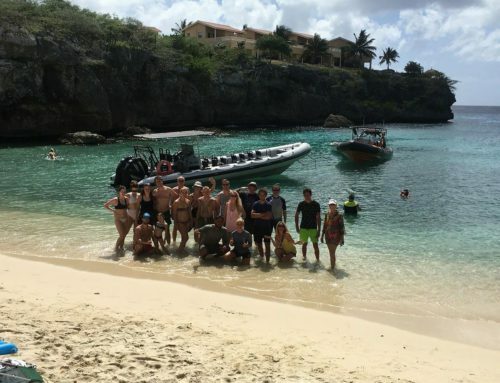 Sometimes, after 3-4 hours the group has seen it all on Klein Curacao and when we discuss it with the group we can head back a little bit earlier and show you the Spanish Water or we can drop you off at a great snorkeling spot named the Tugboat. Because we host small groups the whole trip is quite flexible and designed for your personal experience. Read more about Klein Curacao and the prices here. It truly is an experience you cannot miss! 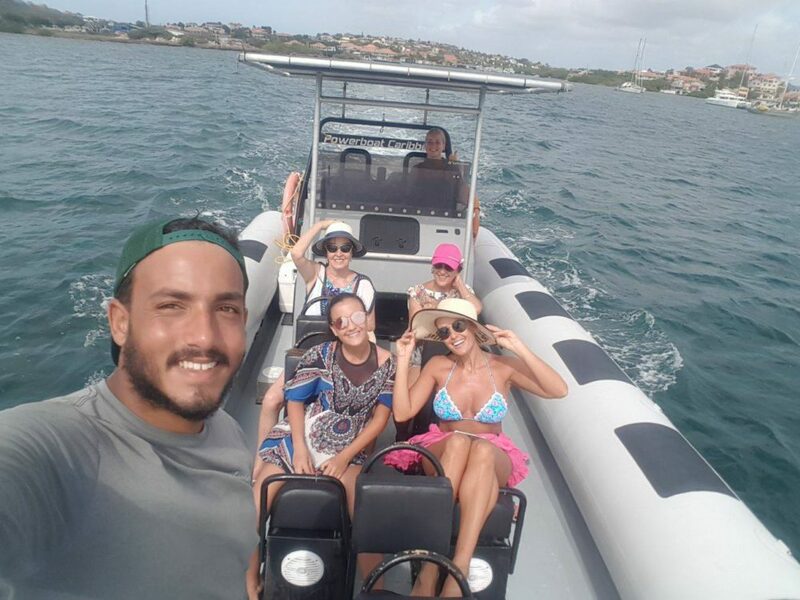 Book your spot by sending an email to reservations@powerboat-caribbean.com, the contact form or by calling us on 0059995669697 (also available on Whatsapp). ‘The Beast’ vs. ‘The Flying Dutch’: meet the two adventures on the water! Discover the west coast with the Powerboat: beach-hopping, turtles and the Blue Room!